This is an incomplete set of Haynes post cards. The box originally contained 100 post cards, but there are 76 here. They're all in mint condition and unused. They are from the C series (1910-1913) and have "Published by J.E. Haynes, St. Paul, Minn. Official Photographer Yellowstone National Park. Copyright by J.E. Haynes, St. Paul" as well as the divided back (narrow T) and postage (1c domestic, 2c foreign). 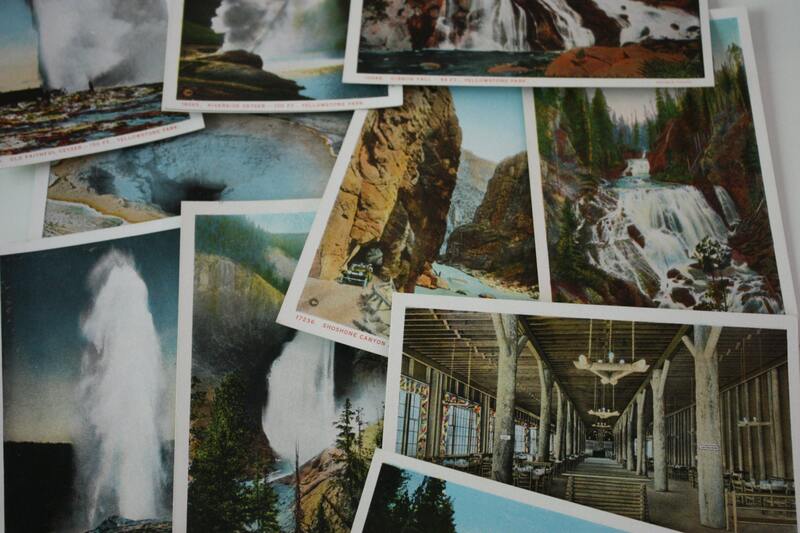 The front of each card has the title of the photo, "Yellowstone Park," "Haynes Photo," and a number- all written in red. There is a copyright symbol on each photo. 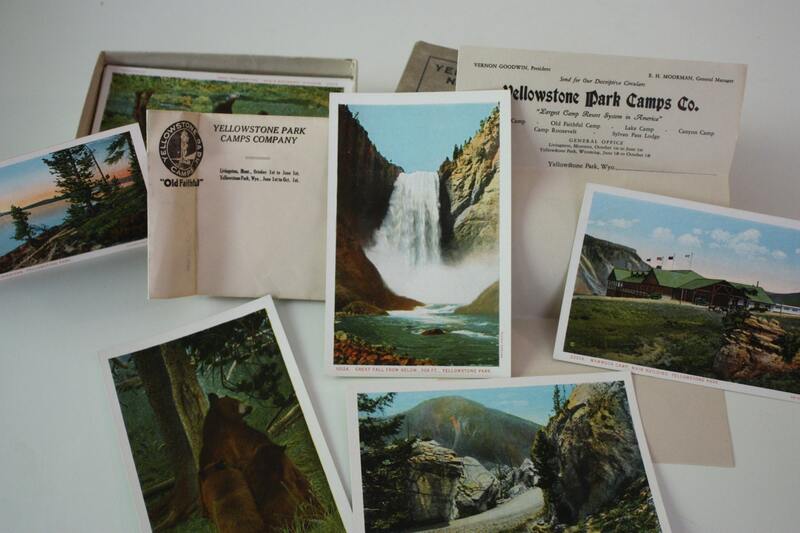 Also included with the post cards and box are a vintage envelope and two sheets of letterhead stationery bearing the names Vernon Goodwin (president) and E.H. Moorman (general manager) and Yellowstone Park Camps Co. as well as other information regarding the park. The most prolific of these publishers was the Haynes family and their chain of photo shops that were located throughout the park. Frank Jay Haynes began his Yellowstone photography business in Yellowstone in 1884 when he received leases from the government for photo shops at Mammoth Hot Springs and Old Faithful. He was at that time Official Photographer for the Northern Pacific RR. The Yellowstone Park Improvement Company, who ran the National Hotel at Mammoth and tent camps at other locations, appointed Haynes their Official Park Photographer – a position he and his son Jack retained (at least unofficially) for over 80 years. 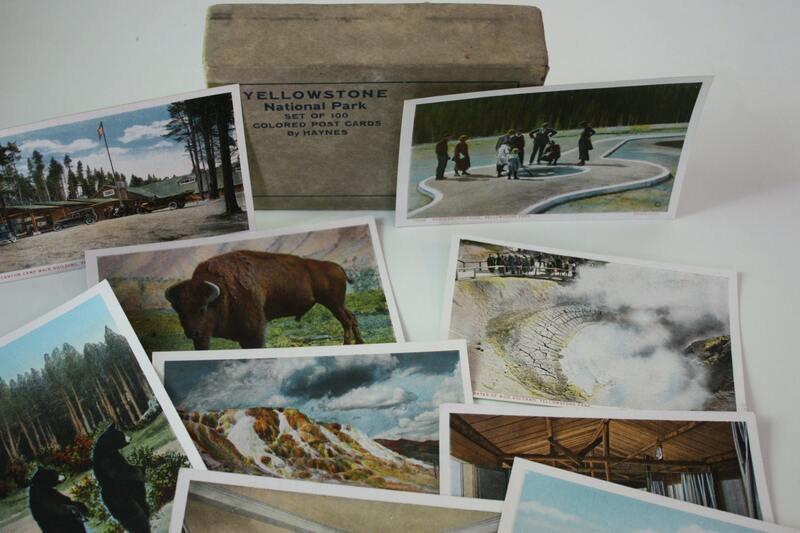 The Haynes family also retained a monopoly on Yellowstone photographs and souvenirs printed with Yellowstone images for many years. 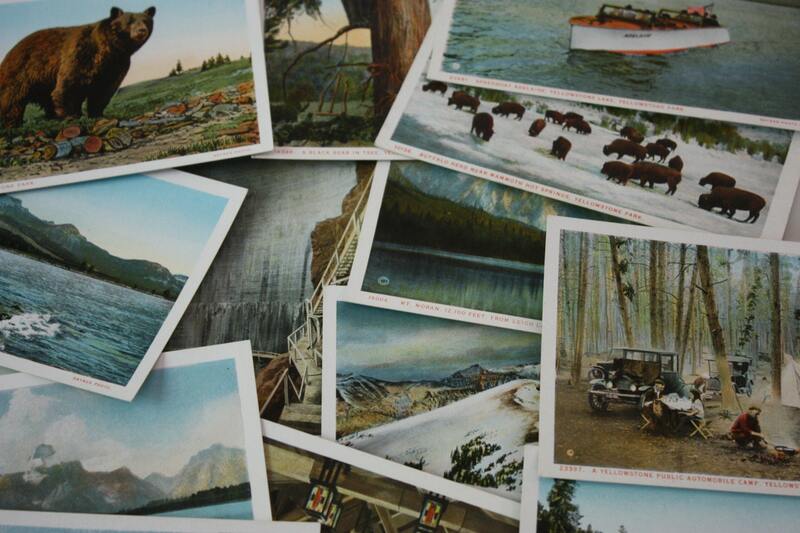 They produced Yellowstone postcards from 1900 until around 1967 when Isabel Haynes, the widow of Jack Haynes sold their 13 picture shops to the Hamilton Stores. Prior to WWI Louis Glaser of Leipzig Germany was the primary publisher for Haynes Postcards. After that time the Curt Teich Co. took over most of the printing business. The Teich Co.of Chicago operated from 1898 to 1978 and was the world's largest printer of view and advertising postcards. The company was founded by Curt Otto Teich, who immigrated to the United States from Lobenstein, Germany in 1896. 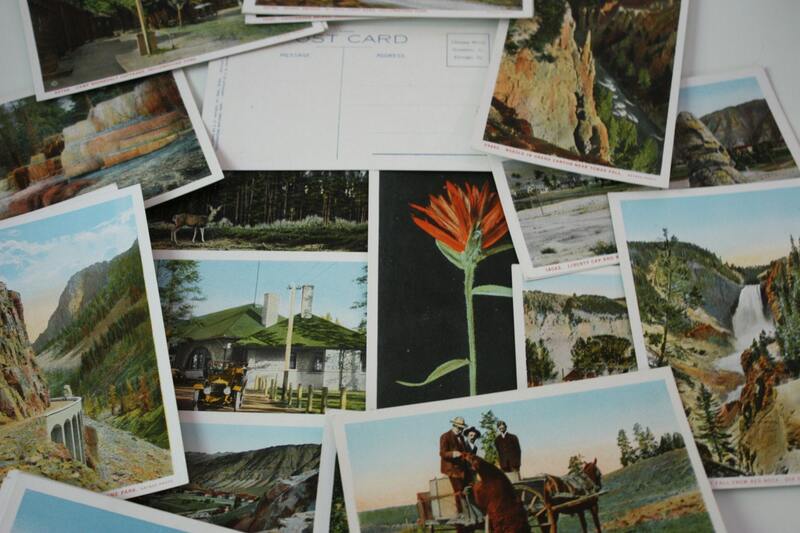 Teich was also the contract printer for the Yellowstone postcards of the Bloom Bros. Co., Sanborn Souvenir Co. and probably others. Thank you also to http://www.thepostcard.com/walt/state/yellow/yelstn.htm for the valuable information on Haynes post cards. Thank you for looking. Please let me know, if you require any further information. Please note that postage covers insurance.